'Bloom' features 16 new songs ranging the stylistic gamut, which has always been Johnson's approach on his solo albums. He is one of the precious few musicians to fully succeed artistically and commercially with this philosophy. The rock 'n' roll raveup "Summer Jam" fits comfortably alongside the bright Bob Dylan cover "My Back Pages," the hypnotic "Sea Secret," lyrically provocative "Sad Legacy" and the rollicking country jam "Tribute to Jerry Reed." His already-astonishing gifts as a songwriter and producer, in addition to his jaw-dropping guitar technique, have grown substantially on this album. 'Bloom' will appeal to Johnson's longtime fans while also bringing new ones into the fold. Johnson is a native of Austin, Texas, which is steeped in blues and country music. But Johnson's music reflects a broader range of influences in addition to blues and country, particularly pop, rock and jazz/fusion. His meticulously-produced albums are almost always equally divided between instrumentals and vocal songs showcasing all of his musical interests. By the time Johnson had reached his teens, he was making waves on the Austin scene. At 16, he was a member of a band called Mariani and by 21, he was part of Electromagnets, a jazz-rock band with an intense cult following. Johnson's burgeoning reputation in the late 1970s and early 1980s led to session work with the likes of Cat Stevens, Carole King and Christopher Cross. In fact, he played on Cross' Grammy-sweeping, self-titled 1980 debut album. One of the most important breaks of Johnson's career was a 1984 appearance on the PBS television show 'Austin City Limits.' Reportedly, Prince saw Johnson's performance and recommended him to his label, Warner Bros. Records. The Warner subsidiary Reprise Records signed Johnson, and 'Tones' was released in 1986. Prince band members Wendy and Lisa even sang uncredited background vocals. The song "Zap" was nominated for a Grammy Award for Best Rock Instrumental. Johnson had already earned considerable coverage from the guitar magazines at this point, and their chronicling of his career increased rapidly. Johnson's breakthrough into the mainstream occurred with 1990's Capitol release 'Ah Via Musicom.' The buoyant, cascading instrumental "Cliffs of Dover" enjoyed mountains of radio airplay across multiple formats. The platinum-selling album was nominated for a Grammy and "Cliffs of Dover" itself earned Johnson a Grammy for Best Rock Instrumental, topping fellow nominees the Allman Brothers Band, Danny Gatton, Rush and Yes. The smooth, supple instrumental "Trademark" is another highlight. 'Ah Via Musicom' gave Johnson the distinction of being the first artist to have three instrumentals from one album reach the Top 10 in any format. He spent three years on the road promoting 'Ah Via Musicom' and then toured with B.B. King and contributed to albums by Chet Atkins and Dweezil Zappa. In 1996, Johnson returned with 'Venus Isle' on Capitol. Notable songs from it include "S.R.V." (a tribute to his friend, fellow Austin native and guitar legend, the late Stevie Ray Vaughan) and "Manhattan." This album illustrated Johnson's growth as a songwriter, producer, vocalist and, perhaps most surprisingly, keyboardist. He promoted the album with the massively successful, first-ever G3 tour, which also featured his friends and fellow guitar virtuosos Joe Satriani and Steve Vai. The live album and VHS home video 'G3 Live in Concert' followed in 1997; the DVD home video reissue came along three years later. The video has been certified platinum. One of Johnson's favorite side projects, apart from his own albums and guesting on other artists' albums, is the blues trio Alien Love Child. The group's 2000 album 'Live and Beyond' was Johnson's first project for Favored Nations, Vai's label. The song "Rain" was nominated for a Grammy for Best Pop Instrumental. 2002 saw the release of 'Souvenir.' 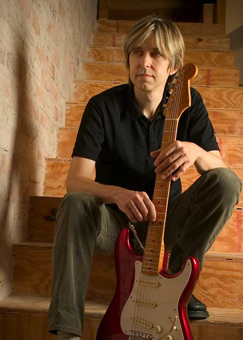 This popular collection of 12 previously-unreleased demos, outtakes and live recordings spanning his entire career is available only through www.ericjohnson.com or at his shows. Johnson went on to surprise his fans, yet again, with a solo acoustic tour in 2004 showcasing his acoustic guitar and piano skills. He was also honored by Martin Guitars with his own signature acoustic model. That summer, he was also invited by Eric Clapton to take part in the Crossroads Guitar Festival. A perennial favorite at the Austin Music Awards, Johnson and his band members won a variety of awards in March 2005 for the 2004-05 time period. Johnson won Austin Musician of the Year, Best Electric Guitarist and Best Acoustic Guitarist, as well as placing high in male vocalist, keyboardist and songwriting categories. Chris Maresh was named Best Bassist and Tommy Taylor earned Best Drummer honors. The release of 'Bloom' and the following tour will be the main highlights of 2005 for Johnson, but the year certainly kicked off on a high note. In January, he joined Fender at the NAMM trade show in Anaheim, California, to introduce his own new Fender Signature Series Stratocaster guitar.